Loon’s approach to connectivity is possible because of technological advances on multiple fronts. Some are measured in time, such as keeping a balloon aloft for nearly 200 days or staying in Peruvian airspace for 98 days. Others, like the one we recently achieved, are measured in distance. First some context, starting with how Loon balloons get access to the internet, which is a prerequisite to providing connectivity to people below. The technical term for this is a backhaul connection. That backhaul connection must pass from a ground access point to a balloon — a big jump that ultimately has some constraints. If a balloon gets too far from this access point, the signal eventually drops away and we’re just a pumpkin-shaped balloon floating in the stratosphere. To overcome these limits we play a game of leapfrog. This game is no child’s play. The backhaul connection jumps from one balloon to the next forming point-to-point links to transmit data between balloons. The distances between balloons are large which means the hardware and algorithms that point the links must be both very accurate and precise. This task is complicated by the fact that our balloons are constantly shifting position relative to one another as they ride wind currents in the stratosphere (more about that here). Over time we’ve experimented with a number of ways of getting balloons to talk to one another. At one point we sent the movie Real Genius between two balloons 100km apart using free space optics. (That technology is proving useful on the ground.) We’ve kept trying new methods, and just last month we hit an exciting milestone. Rather than making a connection 100km between two balloons, we went 10 times farther across seven balloons. 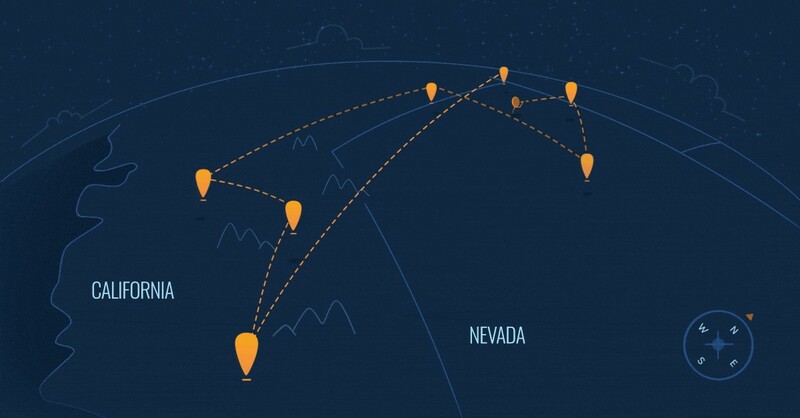 The connection originated from the ground at our launch site in Nevada, where packets of data were transmitted to a balloon 20km overhead. That data traveled nearly 1,000km along a network of six additional balloons, going from desert to mountains and back again. A few weeks later, we achieved another milestone by successfully sending data over 600km between two balloons — our longest point-to-point link to date. These connections were made using custom-built antennas mounted to the bottom of our communications payload. Their accuracy is equivalent to throwing a ball 100 meters and landing it in a wastebasket. In this case, however, the wastebasket was in constant motion in the stratosphere. Why does this matter? It has everything to do with reach. The thing about people is that they tend to live all over the place. Even with our balloons’ expanded coverage area — which is 20 to 30 times greater than a traditional ground-based system — there are people who live outside the reach of one of our balloons operating adjacent to a backhaul connection on the ground. If we can extend our reach by passing that connection across a network of balloons, like a cosmic soccer team advancing the ball through the sky, we can cover far more people. But here’s the best part: We’re not simply extending the connection to the last balloon in the line. Each balloon in the network is capable of passing that connection to other balloons while simultaneously using it to connect users on the ground. Instead of one balloon utilizing one ground-based connection point to serve users, we can use that same terrestrial access point to activate a network of multiple balloons, all of which can connect people below. In this way, we create a web of connectivity to serve users without having to build lots of new infrastructure on the ground, which is a significant obstacle to bringing traditional access to unconnected and under-connected communities around the world. For a long time, a fundamental constraint of connectivity has been proximity, or a lack thereof, to where the internet is now. Loon is working to change this reality by making the internet reach further. With billions of people lacking connectivity there’s a lot of ground to cover. As we prepare to launch commercial service starting in 2019, our ability to make connections across more balloons and longer distances will be a key enabler of our efforts to connect people everywhere.